At Trinity College Dublin where Freshers’ Week is taking place. 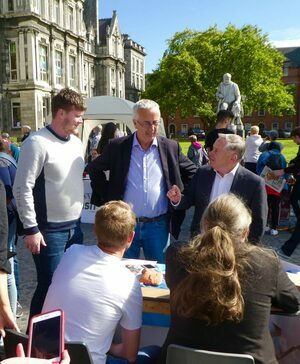 Labour leader Brendan Howlin and Labour Senator Kevin Humphreys mingle with students. Posted in Misc and tagged Brendan Howlin, Labour, Trinity College Dublin at 4:11 pm on September 5, 2018 by Bodger. Comments made by Labour TD Alan Kelly during an interview with Fran Curry on Tipp FM this morning. Mr Howlin said he was disappointed that Mr Kelly would make any comments that would seem like the party is divided when they need to work together. He said there is a collective leadership. He also said that all the parliamentary party, which is made up of seven TDs and six senators, bar Mr Kelly support his leadership. Mr Howlin said the majority of the party’s 50 councillors support him. Posted in Misc and tagged Alan Kelly, Brendan Howlin, Labour, leadership at 12:46 pm on August 31, 2018 by Bodger. Would somebody please give him some power, for pity’s sake. 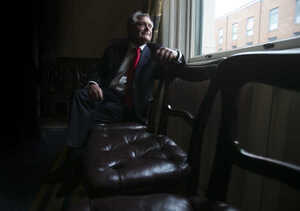 Seven councillors have now called on leader Brendan Howlin to resign and make way for another leader. Speaking to the Irish Examiner, a number of councillors have said Mr Kelly is what the party needs and restated the calls for Mr Howlin to make way…. Posted in Misc and tagged Alan Kelly, Brendan Howlin, Labour at 11:54 am on August 16, 2018 by Bodger. Today’s Irish Independent (online edition). Posted in Misc and tagged Irish Independent headline, Kate Middleton, Labour at 10:57 am on April 23, 2018 by Bodger. 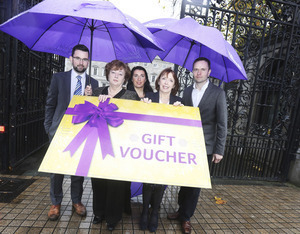 The Social Democrats launch a new Bill – the Consumer Rights (Gift Vouchers) Bill, 2017 – to end the rip-off associated with gift vouchers and cards. The bill would stop retailers “imposing expiration limits of less than five years on vouchers while prohibiting a range of charges connected to their use”. Above from left: Pádraig Rice, Catherine Murphy TD, Anne-Marie McNally, spokesperson on Society and Citizenship, Roísín Shortall TD and Cian O’Callaghan, spokesperson on Housing Quality and Building Standards. 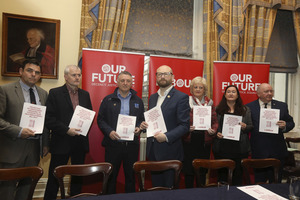 Labour Employment spokesperson, Senator Ged Nash (Glasses) with the General Secretary of the Irish Congress of Trade Unions (ICTU) Patricia King (third right) at the launch of a bill to tackle bogus self-employment contracts that deny workers the same protection and entitlements as their employed colleagues. The Protection of Employment (Measures to Counter False Self Employment) Bill 2017 would put all workers on an equal footing in situations where they are carrying out the same duties, but are not legally designated as ‘employees. Posted in Misc and tagged Labour, Social Democrats at 4:26 pm on November 21, 2017 by Bodger. 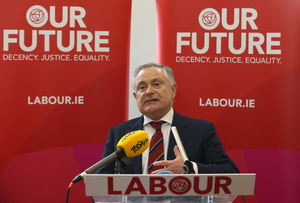 Labour Party leader Brendan Howlin outlines his party’s alternative proposals for Budget 2018. “The future facing our country today is very different than it was five years ago. Our economy has recovered, strong growth continues and unemployment is falling. But there are also many people around the country who are still hurting, and struggling to put food on the table for their families. With our country now at a crossroads, Labour’s Alternative Budget seeks to cut poverty, not taxes. We want to improve public services, build homes and hospitals, employ teachers and healthcare workers, and reduce the cost of living for our future Ireland. 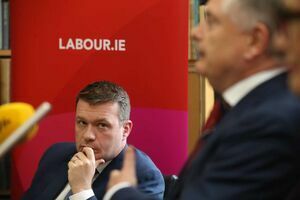 One of the most pressing issues facing us as a nation is the housing and homelessness crisis, and Labour’s Budget includes a fully costed plan to invest nearly one billion euro into building an extra five thousand public houses in 2018. In the key area of health, we are also committing to funding Sláintecare [a 10 year plan to revolutionise the health service with cross-party political support]. – a plan that must be delivered upon by Government. Posted in Misc and tagged Budget 2018, Labour at 4:43 pm on October 4, 2017 by Broadsheet. Combustible Tippperary TD Alan Kelly sat down with Jason O’Toole of Hot Press magazine, on shelves from today. “I would like to see the Social Democrats, in particular, and the Labour Party coming together.There should be a natural coming together. They have many fine members. It’s hard to distinguish between Social Democrats and Labour. And there’s others: there’s Independents and people across other parties. 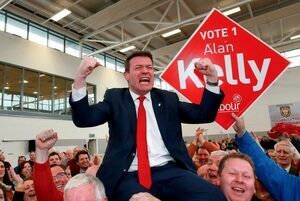 Posted in Misc and tagged Alan Kelly, Labour at 5:07 pm on August 17, 2017 by Broadsheet. 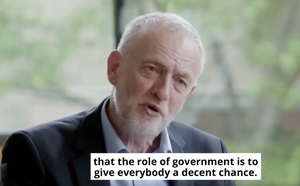 UK Labour Party General Election broadcast directed by Ken Loach. Posted in Misc and tagged jeremy corbyn, Ken Loach, Labour at 11:36 am on May 16, 2017 by Broadsheet. Fianna Fáil’s Jim O’Callaghan says the answers for these Garda scandals have not been given and want answers from Tanaiste… The party says it’ll consider options after hearing from Tanaiste today and Commissioner attends committee on Thursday. Posted in Misc and tagged FF, Frances Fitzgerald, Labour, Leinster House, Noirin O'Sullivan, PBP at 12:15 pm on March 28, 2017 by Broadsheet. It’s all free water under the bridge. 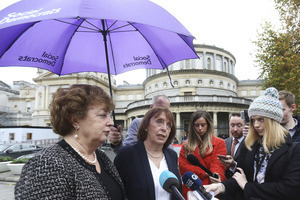 “We were under the cosh to build a huge utility like Irish Water. To get a national metering programme in place and charge for water in the space of three years, which we just should have said no to. I’m sorry we didn’t. 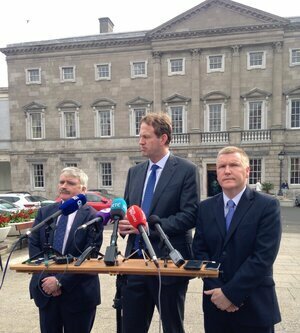 “Within Government, we certainly had that battle with Fine Gael. At a critical point, the decision we made was to stick with it as opposed to pulling down the Government at that stage. “Because we were afraid of the consequences for our country if we pulled the Government down. But we paid too high a price for that and we should certainly have stood our ground in relation to Irish Water. “This was one of the things we had to make progress on. Because they were signing off monthly on the paycheck for the nation, in order for us to pay pensions and pay the cost of wages and so on. Minister for Public Expenditure Brendan Howlin has said that there cannot be a situation where people decide to not pay their water bill. 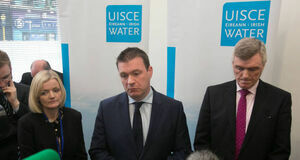 It follows on from Environment Minister Alan Kelly’s comments on Monday night, in which he refused to rule out measures that could mean unpaid charges are recouped from peoples’ wages and social welfare payments. Posted in Misc and tagged Brendan Howlin, Irish Water, Labour at 5:02 pm on January 4, 2017 by Broadsheet.